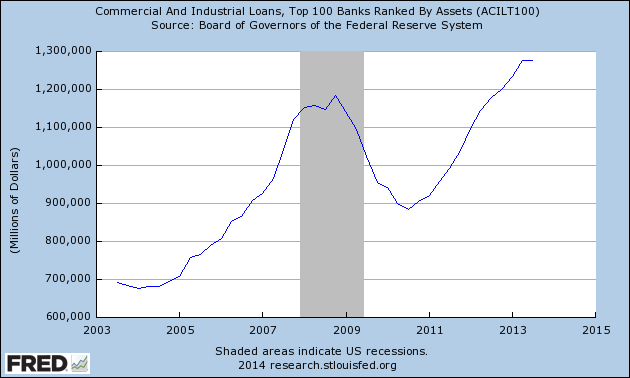 By December 2007, the economy officially entered a balance sheet recession awash with massive deleveraging. The population became less creditworthy and less confident in future income, and balance sheets contracted as loans were closed out and minimal new credit was issued. By the end of 2008, the Fed had lowered the Fed Funds target rate to zero. The Fed hoped that driving down interest rates would make outstanding loans less expensive and new credit creation more attractive (see Figure 1), resulting in new money that could be used to stabilize crashing asset prices. In addition to regular open market operations, in October 2008 the Fed entered a new territory of stimulus as it began paying banks interest on reserves held at the Fed for the first time in history. The Fed hoped that this interest income would help recapitalize banks, and would also give the Fed another tool to use when targeting the Fed Funds rate. The thinking being that banks would not lend out reserves for less than what the Fed is paying them, in this case 0.25%. Paying banks interest on reserves held at the Fed was an important development of the current stimulus program given that the Fed’s open market operations, and later QE, were effectively based on building up bank reserves held at the Fed. When the Fed’s target zero interest rate level was realized in December 2008, deleveraging of the economy was still accelerating and asset and stock prices were far from normalized. The Fed had a mission to continue with stimulus, but having already taken rates to the floor, the Fed chose to experiment with a more targeted asset purchase program referred to as Quantitative Easing. By the time QE1 was complete, the cost of bank lending had decreased as planned, but it did not matter because banks were still not lending (see Figures 3-8). Creditworthiness and confidence, essential for credit creation, had still not returned to the U.S economy. Even though QE1 delivered lackluster results, the Fed proceeded with QE2 only seven months after QE1 purchases were complete. QE2 was a continuation of QE1 targeting MBS and long bonds, buying $600 billion worth of securities over six months.